On May 14, 2017 my life will change forever. that’s me! 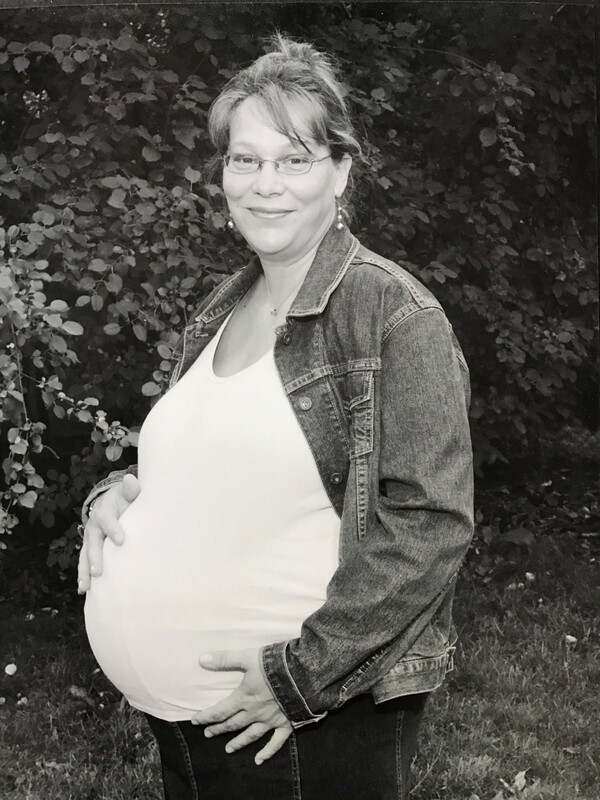 Pregnant in my forties. Mother’s Day is fast approaching and I’m beyond excited. Good Q:. I’m a mom already to four really interesting kids. (I’m sure every Mom says that). I also have 2 baby angels waiting for me on the other side — but I’ll write about them later. Why am I beyond excited? This year . . .
OK, it sounds weird to me too BUT hear me out. I won’t bore you with my entire story here and now — I’ll write about that later. The upshot is that I have chosen in my 50th year to finally live the life that I’ve always wanted to live . . . starting from where I am. I’m keeping the minivan, the kids, the husband, the house AND/BUT living fully and open-hearted. There will be changes along the way as I embrace and share with you my attempt to live my life as a prayer. On my 50th birthday — I had a very low key celebration. Hubs, the kids and my brother and his family were at my rustic cabin that sits near the lake. My goal was to share a intimate moment with each one of them — some planned and some just happened. The unplanned events are the ones that made the biggest impact on me being here today sharing my story. My daughter asked that question as we kayaked from Wiggle Bay to our dock (unplanned event). The inquiry took my breath away . . . or it could have been that it was a very hot day and I’d been on the water already for several hours, being out of shape I suppose delirium could have set it in. But just like that . . .
My reply: I feel amazing. I feel like I have hit the reset button on my life. I feel an incredible responsibility to myself to start living the life I gave up along the way. I want to be me. She looked at me like I was crazy and paddled faster. Then she stopped, looked over her shoulder and said “Mom, I’ll love you no matter what.” We kayaked back to the dock in unison, a unspoken knowing of deep love. My Dad died at 49. In some weird way, I thought I too would die at 49. I lived life to the absolute fullest until I got married, settled down and had kids. Married life was responsible not raucous. My intention was to be the most I could be in each situation. Not best, most. After my daddy died, I started making check lists in my mind. What animals I would have, what jobs I would have, what I would do if my mom died? my brothers? I planned out many aspects of my life except the part where I would live past 50. I had no plan. As I approached my birthday I was more and more anxious — I mean death was looming. Some days I was terrified knowing that it could be “the day”. I vividly remember my dad’s last day on earth, I worried that I wouldn’t remember mine. That panic induced thought was a catalyst for living sacred. Spoiler Alert: I didn’t die. Not exactly, not in a typical dead, Mass, funeral, throw dirt on you kind of way. The morning after . . . the bonus round. I woke up 50 years old and one day, in the cabin my dad built . . . I was in the bonus round. In my mind, I had cheated death. I wondered what my dad would have done had he not died that cold February morning but instead woke up in his cabin ready to catch the morning bluegills or a pike. In that moment, I knew I wanted to change. It was only a thought, backed up by a feeling of sassy aliveness. Without understanding fully, I entered into what I refer to now as sacred living. Me holding my baby boy. I just did the math, are you ready for something crazy? From my birthday in August until Mother’s Day is 40 weeks. The time it takes to grow a baby. (Unless of course you are my own kids where one was 2 weeks early and the others were well past two weeks overdue!! I’ll write about that later. My story is your story. We all live the same human experience at different times. It is time for me to share with you my bonus round. I’m just a simple mom. I’m not jet set, but love my little cabin. I don’t have an incredibly important job with multi million dollar deals, but I do have a micro business that I love. I make great meals with local seasonal food and teach kids how to read. There is nothing fancy about me. The beauty of my life is the simplicity. Celebrate with me as I enter into this next season of my life. I am determined to find (and share) the sacredness in the everyday moments. As I changed my mindset from living a boring life of breakfast, lunch, dinner, laundry, and driving circles of drop offs and pick ups to a life grounded in routine. When we have a routine or a daily practice we enter into a space of allowing these moments to become sacred, if we let them. I’ll write about that later . . . I have quite a bit to share from my journey from boring and ordinary to sacred . . . and the new and unexpected miracles we have yet to experience — together. I’d like to end with a quote by Rumi that I feel has lead us to each other. We are never alone. What you seek, is also seeking you. This story is dedicated to my dad, without him I wouldn’t be here, without him dying, I wouldn’t have this story . . . and so many more. I’m struggling with getting my pre-baby body back.